Jeremy founded Athletic Jaier FC in 2003 with his brother Jason. Since then, they have served as the Training Directors. During this time they developed and instituted a soccer program based on a curriculum of player development first and foremost. It is one of the few programs who maintain the integrity of their curriculum by not just saying they are developing players but also putting it into action. Winning is important but results are secondary to the needs of the player. Jaier FC continues to believe that winning is the by-product of focused player development; winning is not emphasized at the expense of player development so the coach can build his or her resume. The players will always come first and foremost. This focus on player development and the Jaier Curriculum has helped to produce 28 college players who have participated at every level from NCAA DI to NCAA DIII and NAIA as well as ODP State & Regional Players. 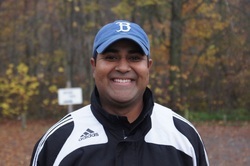 Jeremy is also Co-Head Coach of the Men’s and Women’s Varsity Soccer Programs at Lake Michigan College. The Redhawks will kick off play in the Fall of 2013. From 2004-2008, Jeremy was the assistant coach for the Men’s and Women’s teams at Cumberland University (NAIA) in Nashville, TN. While at Cumberland, Jeremy was heavily involved in recruiting and training for the Bulldogs. In 2005, the Cumberland Women finished 12-5-2, 5-1 in the TranSouth Athletic Conference. The 2005 season included the biggest win in school history over #1 nationally ranked Lindsey Wilson University and a #23 final national ranking. Also in 2005, the Cumberland Men finished 12-5-2, finishing in 1st place in the TranSouth Athletic Conference with a perfect 5-0 record. During his time at Cumberland Jeremy worked with several Academic and Athletic All-Americans and players that went on to represent their respective National Teams in International competitions as well as having the opportunity to play professionally in the United States, Scotland, England, Italy, and Portugal. Prior to his time at Cumberland University, Jeremy led the Bridgman High School Varsity Men’s Program from 2000-2003 to new heights and successes. During his time leading the Bees, his teams won two District Titles, a Regional Title, and made one appearance in the Division 4 State Semi-finals. For the success of his players Jeremy was named MHSAA Coach of the Year in 2000 and 2003. Jeremy has coached teams for Kalamazoo Kingdom Youth Soccer club and TKO. He has also coached at various camps and clinics including Calvin College, Kalamazoo College, and the successful Jaier Summer Camps. Jeremy played soccer at Stevensville-Lakeshore High School, Calvin College, and in the PDL for the Kalamazoo Kingdom and Grand Rapids Explosion.